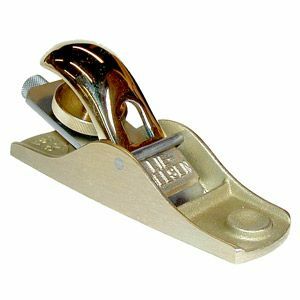 The Lie-Nielsen #103 Standard-Angle Block Plane is the brother to the #102 Low-Angle Block Plane. The #103 plane has the iron bedded at 20 degrees, which along with the 25-degree bevel that comes on the iron, presents a 45-degree cutting angle to the wood (being a bevel-up plane). For those who aren’t hand-tool aficionados, this is the same cutting angle as standard bench planes. This angle is good for all-around work and even somewhat thicker shavings, compared to the Low-Angled planes, which excel at end grain and super fine cuts. The size of this block plane (5 1/4” long) fits so nicely in the hand, and is small enough to drop into a shop apron’s pocket, making it so easy to have within quick reach at all times. I love to use my small block plane in a number of ways, including edges of boards as well as smaller focused areas on the face of a board. The small block planes are easily a favorite of mine. The body of the #103 is made from bronze, which has some distinct advantages. One of the advantages is how the extra mass of the bronze version is heavier than a like sized plane made from ductile cast iron. This extra mass makes it easier to keep the plane moving through the cut. Another important advantage, especially for those who live close to a body of water, is that bronze doesn’t rust. However, be sure to recognize that the A-2 cutting iron is still susceptible to rust, so make sure to apply a thin layer of Jojoba oil or Camellia oil to slow down the rust monster on your iron. Even though the bronze bodies will not rust, they can oxidize, which makes them less bright and shiny. Some people prefer the natural patina the bronze gains, as it ages, but for those who would rather retain the “bling” of the polished bronze, it just takes a little effort. A product called the Sunshine Polishing Cloth is available, and is regularly used by the Lie-Nielsen crew, on all of their bronze products. This cloth does a remarkable job of removing any oxidation, and restoring the original luster. The #103 has an iron made of A-2 tool steel, hardened to Rockwell 60-62. This iron holds an edge for a very long time, but with A-2 , it is best not to hone the bevel at less than 30 degrees. The carbides in A-2 tool steel are fairly large, and when the angle is less than 30 degrees, the carbides at the edge of the iron don’t have enough support. I keep my honing on A-2 tool steel at 30 degrees or higher, and I’ve personally experienced great results. As with most planes, I start honing the iron on a 1000-grit stone and finish with an 8000-grit. This will provide a shaving-sharp cutting edge. To accelerate the process, I usually hone at 5 degrees higher than the original bevel angle. (e.g. if the iron came with a 25 degree bevel, I hone at 30 degrees). This saves a great deal of time, as I’m only working a very thin sliver of metal at the cutting edge of the iron. When working the bevel of an iron direct from the factory, I can expect to take 5 strokes or less on the 1000-grit water stone. I feel the back of the iron to see if a burr is formed all the way across the cutting edge to determine if more attention is required. After I have a burr tip-to-tip, I move to the 8000-grit water stone. I usually take the same number of strokes on this stone as I did on the 1000-grit stone. To hone the back of the iron, I remove it from the honing guide, and using David Charlesworth’s ruler trick, place a thin 6” ruler on the surface of the 8000-grit water stone. The ruler should be at the edge opposite from where the cutting edge of the iron will be. Start with the cutting edge of the iron just slightly overhanging the edge of the water stone. With the iron riding on the ruler, pull the iron back until the cutting edge is about a 1/2” or so onto the stone, then push it forward so its just off the edge of the stone. This movement can be compared to a piston, pushing the iron forward so the cutting edge is just off of the stone, then pulling it back so it’s again about 1/2” on. Repeat this 8 to 10 times while moving slightly laterally with each stroke. Wipe the back of the iron off, with a towel or a paper towel, so you can check your progress. When you see a very narrow polished band, all the way across, at the cutting edge, you are finished. I can usually complete the total sharpening process in about 2 minutes, but just like anything else, speed and comfort with this process will come with practice. Check out a video of the sharpening process here. You can also find additional tips on sharpening, like what honing guides to use, adjustments for honing guides, how to make a jig to achieve consistent sharpening angles, and a whole lot more, on the Lie-Nielsen YouTube channel. To set the iron for an even full-width shaving, back the spin wheel off until the iron is adjustable, but still keeping the iron under slight tension. Using the adjuster nut, wind the iron back into the body. I like to place a piece of white paper on my bench, so it’s easier to see the next step. While holding the plane over the paper, sight down the plane sole, so you can see when the iron starts to project. Turn the adjuster nut clockwise, and stop when you see a little black line showing through the mouth of the plane. This narrow black line is the front of the iron. Now that you see the iron, look to see if it is even across the plane. If not, light taps on the side of the iron, near the adjuster nut, will help even the iron in the mouth. Once you have the iron laterally positioned, again sight down the sole. Turn the adjuster nut counter-clockwise, while watching to see the black line disappear. Stop just after it leaves your sight. Now rotate the adjuster nut clockwise, just until you feel slight pressure, taking out any backlash. Depending on your eyesight, it’s possible you may have enough iron projecting to test your settings, without needing to advance the iron further. I know I’ve watched the iron as it “left my sight”, only to find I’d actually left it out by about .001”. To finalize and verify your setup, put a thin piece of wood in your vise on edge, and see how your plane behaves. Start by testing both the right and left sides of the iron, to see if the shavings are of equal thickness. If the iron doesn’t yet engage, turn the adjuster nut clockwise by a couple of minutes (thinking about the face of a clock) and test. Repeat this process until the iron is engaging the wood. This will prevent overshooting a fine shaving. The testing on both edges of the iron provides feedback relating to how even the iron is oriented in the mouth. If the shaving from each side isn’t equal, another light tap or two should resolve that issue. If both edges cut similarly, setting the overall thickness of the shaving is next, and ultimately a repeat of the above process of advancing incrementally. When you reach the thickness of shaving you want, re-apply the 1/4 turn of the spin wheel and see how the plane behaves. If the plane needs further adjustment, just follow the same procedures of releasing the spin wheel’s pressure on the iron, adjust, then re-apply the spin wheel. Once you get used to the process, it will feel like second nature. I hope this helps answer any questions about this plane. Please let me know if you have any specific questions I may have missed. Click to take a closer look at the Lie-Nielsen #103 Bronze Standard Angle Block Plane.